Dharmaraja (Yudhisthhira) accepted the advice of Vâsudeva, as well as the benedictions of Vyâsa. He sent his brothers, with the army, to bring the gold that had been thrown aside by the brahmins. They left after purifying themselves by partaking consecrated offerings. They discovered the quantities of gold that had been given as presents to the priests at the conclusion of the sacrifice by Emperor Maruth in the past. They had dropped the gold on the sides of the roads along which they returned home. The army collected these and conveyed them to the capital on camels, elephants, chariots and carts. It took them some days to reach Hastinapura with all that load. They unloaded the gold, amidst the acclamations of the people. The citizens were amazed at the success of the expedition; they extolled the good fortune of the Pândavas. They welcomed into the city the princes and the gold shouting "Jay, Jay" until their throats were hoarse, jumping and dancing in joy. They pictured among themselves the grandeur and magnificence of the sacrifice, for which this gold was brought. Preparations were started that very day for the construction of the ritual altar and the necessary adjuncts on the bank of the Ganga; the sacred area was many square miles in extent. The ground was levelled and cleaned. The dais was built; beautiful buildings arose on the vast area. Porches and verandas were added. Decorations like flags and festoons embellished the structures. 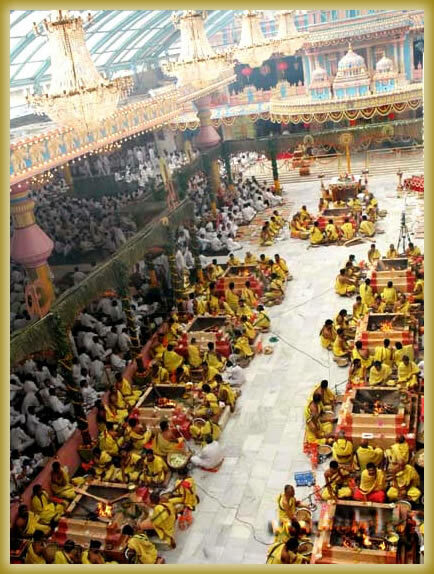 When the holy day neared, chieftains, brahmins, scholars and sages moved from all directions towards the sacred place, hastening each other in their enthusiasm to reach early. They took residence in the quarters allotted to them, according to their status and needs. They spent the night counting minutes, in joyful expectation of the extravagant but efficacious yajña that they could witness when the dawn brings in another day. The morning came. The auspicious moment approached. The priests took up their positions and got ready to take the vows of initiation. They stood up facing Lord Krishna and the King and said, "0 King! we understand that you have resolved to perform not one but three As'vamedhas. Is that correct? If so, do you desire us to perform them, one after the other? Or, shall we repeat every formula and rite, thrice and have them all concurrently? If you make it known, we shall arrange the participants and performing priests accordingly." At this, Dharmaraja replied, "what can I say when you know best; I shall agree to whatever advice you offer; I seek only the consent of Vâsudeva for whatever course we adopt" and he turned towards Krishna with pleading eyes. Krishna left the decision to the brahmins. They discussed among themselves for a while and announced at last that the effect of "three As'vamedhas" can be secured by repeating each mantra thrice and presenting the brahmins presiding over the rituals thrice the usual fees. Vâsudeva indicated His approval of this suggestion, and taking his cue from this, Dharmaraja declared that he was agreeable. He desired that the yajña might be inaugurated. 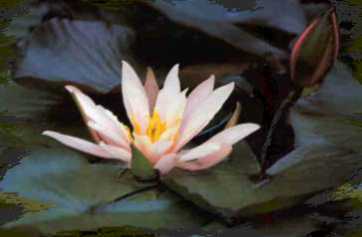 The recitation of the mantras by the brahmins shook both earth and sky. The preliminary rites were gone through and the sacrificial horses proceeded on their planned round. They were caparisoned in great style and they carried on their foreheads the declaration challenging any one to take them into custody if he dared. When He, who is the recipient of all yajñas, (yajñaswarûpa) has taken the role of the presiding authority, no words can describe the fortune of the participants and the witnesses. It drew to a successful close with the Valedictory Oblation (purna-âhuthi). The experts in sacrificial mantras, the sages and the brahmins were loaded with presents and fees. Enormous numbers of cows, large areas of land, and vast quantities of gold were gifted away by the King. The whole nation was filled with happiness. Every one was praising the yajña as indescribably superb. All who came were fed sumptuously at all hours. Sages and ascetics who saw all this lavishness extolled the yajña of Dharmaraja as grander even than the yajña performed by emperor Maruth in the past! They were delighted they got the chance to partake in this yajña. People once claimed that the yajña of Maruth was presided over by Indra, the Ruler of the Gods and they felt that it made it incomparably superior to any other sacrifice. But now, they congratulated Dharmaraja on securing the yajñaswarûpa (Vâsudeva) Himself to preside over the yajña, a piece of good fortune far superior to Maruth's and far more difficult to secure. At the end of the yajña, those who had come from far off places returned; others too turned home. The kings and chieftains took respectful leave of Dharmaraja and went back to their own principalities. The kinsmen of the King stayed for a few days more and left at their convenience to their places. (See also S.B. 1.11). However, Lord Krishna chose to spend some more time with the Pândavas; so, He stayed on in Hastinapura. The Pândavas were delighted at this signal act of grace; they made suitable arrangements for the residence of the Lord; they served Him every day, they filled their eyes with His beauty, they filled their hearts with His gracious words of instruction; they spent the days in supreme joy. After some time spent thus in the Pandava capital, Krishna returned to Dvârakâ, taking Arjuna with Him. The inhabitants of Dvârakâ were overjoyed when their Lord returned to His capital. They welcomed Him in enthusiastic reverence. They feasted on the darshan of the Lord and were immersed in ânanda. Meanwhile, news came to Hastinapura that Vidura his uncle was moving about on the environs of the city in the guise of a monk; it travelled from mouth to mouth and at last reached the ears of Dharmaraja, the King. The news was received with surprise and joy. He sent a few scouts to discover whether the news was authentic, and soon, they brought the welcome information that Vidura had actually come and was present. Dharmaraja could not contain himself with excitement. "Ah! How happy you have made me! ", he exclaimed. "This holy moment has made the dried trunk of the tree of hope put forth leaves again. Oh, I can now see and serve Vidura who fostered us and guarded us and guided us, I who feared I might not get the chance at all." The heartening news was spread by courtiers among the queens and princesses and women of the royal household. Dharmaraja did not rest; he spoke about the great event to everyone around him; he sought out others to share with them the joy. He issued orders to the army that appropriate arrangements should be made to welcome into the capital the brother of his late father, sage Vidura, foremost among the votaries of the Lord. The citizens too were alerted and asked to prepare a grand reception. They decorated the streets and mansions on each side of them; they erected arches and hung festoons and hoisted flags. They allotted galleries and seats on every road for children, women, and the aged, so that they might have a fine and clear view of the procession and of the great Sage. It was an inspiring sight to see many old men and women hobbling on with their sticks, eager to get a glimpse of Vidura, whom they extolled as the very embodiment of dharma, as the very god-father of the Pândavas. Some thought at first that the sighting of Vidura on the outskirts of the city must have been in someone's dream, and not in actual fact. They had lived long enough to swallow the rumor without personal verification. For, they never could believe that Vidura would ever come back to Hastinâpura. They grouped themselves on vantage points and got ready for the great moment when they could rest their eyes on the saint. All along the route, every building was overflowing with humanity; the trees carried strings of adventurous youth, full of excitement and expectation, shouting in acclamation of the oncoming guest. The King decked in ceremonial robes ascended the royal chariot and started out of the palace with his brothers to bring home the famous votary of the Lord. Vidura appeared before them walking barefoot, slow and dignified, with matted hair and wearing the robes of a monk. The King and his brothers stepped down from their vehicles, bowed reverentially to the feet of Vidura and walked behind him, at a respectful distance. The citizens ran forward and fell at Vidura's feet, in spite of the earnest entreaties of the guards that they should desist. The Pândavas could not express welcome in words; their joy was immeasurable. So, their eyes spoke it, with tears of gratitude. They clasped Vidura in their arms and prayed to him that he should get into the chariot so that the thick ranks of onlookers on all the roads might get darshan to their hearts' content. Vidura was persuaded to agree. 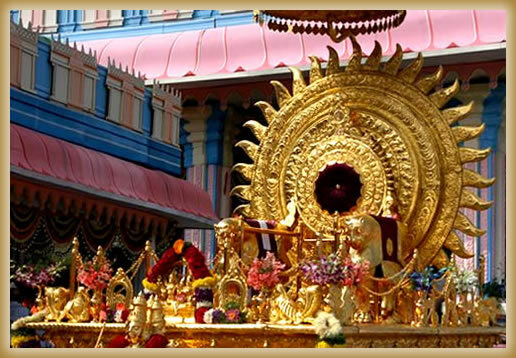 Seated in the royal chariot of the King, Vidura gave darshan to the people who had amassed en route. At last, the procession reached the palace. It was a sweet flood of song and joy that flowed along the roads of the city that day. Some of the citizens were so overcome with joy that they were rooted to the spot. The arduous life of tapas that Vidura had undertaken had so transmuted his personality that he appeared a different person, a person glowing with divine aura, like Indra, the king of Gods. The people were describing their exultation in their own words to one another. Many shed tears remembering the trials and tribulations which Vidura had undergone and the peace that he had acquired. The queens and princesses too had darshan from inside the purdah and they were supremely happy. India, Andhra Pradesh, c.1800. Courtesy: LACMA.